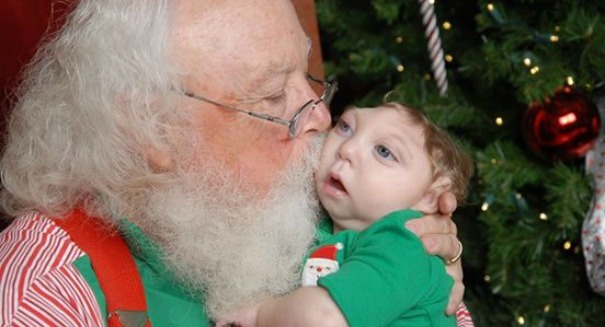 A 15-month-old with a rare developmental disorder was given the chance to meet with Santa Claus after he was given just a week to live. It’s a heartwarming and deeply touching story just in time for the holidays. According to a report from Tech Times, Jaxon Buell, a 15-month-old baby born with a partially developed brain was given the chance to meet with Santa Claus for the first time in his life. Jaxon was diagnosed with a rare disease that left part of his brain and skull missing, and was given only a week to live. Despite the grim outlook, Jaxon is in good enough health and spirits to take a brief visit to the mall to have a photo snapped with none other than Chris Kringle. His mother, Brittany Buell, posted the photos of the visit to Facebook, showing a happy Jaxon sitting in the lap of a friendly Santa. Jaxon’s father, Brandon buell, also posted his feelings on Facebook, thanking friends for their support and prayers. He was extremely grateful that Jaxon has made it long enough to see another Christmas. Jaxon came into the world on August 27, 2014 and was diagnosed with microhydranecephaly, a rare brain condition combining symptoms of mycrocephaly and hydranencephaly, characterized by slowed physical and intellectual development and a shortened projected lifespan. When he was born, doctors predicted that Jaxon only had roughly a week to survive. 15 months later, Jaxon is still kicking and doing what many American toddlers do this time of the year: meet with the popular authority on Yule-tide joy. Jaxon’s family is extremely thankful for the support of their friends and family, saying that he and his wife are remaining in high spirits despite their son’s condition. He spoke out against the sentiments of people who suggested that Jaxon might have been spared suffering later on in life by terminating the pregnancy, saying that nothing could break his family’s spirits, Jaxon’s included. Despite the fact that Jaxon’s life may be cut short due to his illness, the young boy has inspired countless people already with his story. For other disabled children, the willingness to go on can serve as a strong example for living with a serious condition. Jaxon can now walk, talk, smile and laugh. He has use of his senses of sight and sound, and is even learning to eat on his own. Jaxon’s family shows nothing but a positive attitude, which is extremely refreshing in a world of serious and sensational headlines. Buell’s Facebook post expressing his gratitude for Jaxon’s chance to meet Santa can be found here.